This week on Fieldstone Common our featured guest is Tasha Caswell, curator of the exhibit Through a Different Lens: Three Connecticut Women Photographers at the Connecticut Historical Society. Tasha Caswell is the Thorne-McKenna Curatorial Assistant at the Connecticut Historical Society. Since last October, she has been working to catalog and digitize the photographs by Harriet V.S. Thorne and Rosalie Thorne McKenna that were recently given to CHS by the Rosalie Thorne McKenna Foundation. Tasha has degrees from Ryerson University and George Eastman House, the University of Toronto, and Lewis & Clark College. She recently completed a ten-month student residency at George Eastman House, International Museum of Photography and Film, where she catalogued 19th- and 20th-century and contemporary photographic and audiovisual materials. This exhibition at the Connecticut Historical Society (October 11, 2013 – March 29, 2014) presents the work of three female photographers, who came from very different places in Connecticut history and society. Each of their photographs is a record of personal and local history, a picture of the people, landscapes, and buildings of Connecticut. Together they reveal how women have taken part in amateur and professional photography from the late 1800s into the mid 1900s. Through a Different Lens: Three Connecticut Women Photographers is available for purchase fromthe Connecticut Historical Society. Tasha and I spoke about the three pioneering women photographers featured in the exhibit: Harriet Van Schoonhoven Thorne (1843-1926), Rosalie Thorne McKenna (1916-2003) and Marie Hartig Kendall (1854-1943). Harriet Thorne was from a wealthy family and focused her photography on portraits, mostly of her family. Her great granddaughter, Rosalie McKenna became a professional photographer before discovering her own ancestor’s connection with photography. She also did mostly portraits with some photos of Stonington, Connecticut where she lived. Marie Hartig Kendall, was a photographer and business woman who sold her photographs where ever she could. She focused extensively on the town of Norfolk, Connecticut. We also talked about what a curator looks for when creating an exhibit. 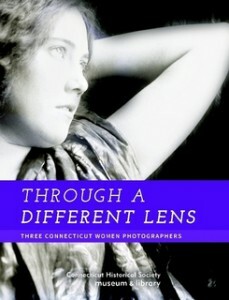 One copy of Through a Different Lens: Three Connecticut Women Photographerswas given out to the Fieldstone Common audience courtesy of the Connecticut Historical Society. Congratulations to our winner and thanks to the Connecticut Historical Society for their generosity in donating the book! 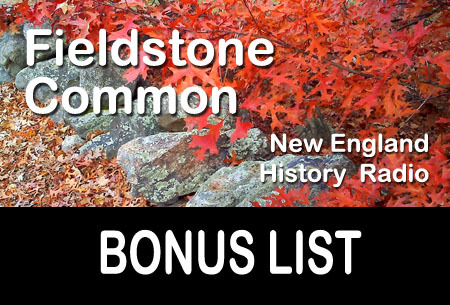 Question: What’s that’s new stuff in the Fieldstone Common title (FC 81)? Answer: That makes it easier, especially for iTunes and other podcast listeners, to keep track of which episode they are listening to. FC stands for Fieldstone Common and 81 is the number of the episode.